Summary: Sea turtle education awareness tools including brochures, posters and billboards relay vitally important information to the general public. They are, however, unlikely to be easily accessible when an individual encounters a turtle that is nesting, injured or stranded. 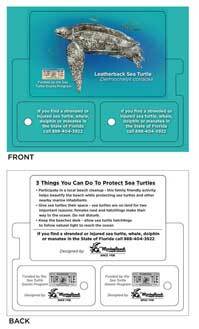 To address this problem, Marineland Dolphin Adventure will create between 10,000 and 15,000 Protect Sea Turtles cards and key tags for distribution to visitors and residents of coastal. The cards are wallet sized with two detachable key tags, one for car keys and one for boat keys, which list the FWC Wildlife Alert toll-free number. The goal of this project is to provide between 10,000 and 15,000 members of the general public with an easy way to immediately access help when they encounter a sea turtle in need of assistance. Results: The 15,000 cards were produced and delivered by MotivMedia to Marineland Dolphin Adventure. Cards were distributed via Marineland Dolphin Adventure and through external promotional events. An article on the cards appeared in the December newsletter. Link to information about the sea turtle cards added to Georgia Aquarium's website. As of May 1, 2016 a total of 14,900 cards have been distributed, the final 100 will be distributed within the month.